Hi DIYers! This is an update on Honeywell's partition support rollout for Total Connect 2.0. We previously posted that Honeywell was releasing partition support for TC2 users in stages. This update will allow users to control multiple partitions for compatible systems from Total Connect. If your update has not gone through successfully, please contact us at support@alarmgrid.com, or call us at 888-818-7728 during normal business hours, which are 9am - 8pm Monday thru Friday. If you would like to learn more about TC2 partition support, please click here. Telguard has announced that their HomeControl Flex service now supports Amazon Alexa. Users can provide voice commands through an Amazon Alexa device to operate home automation devices. 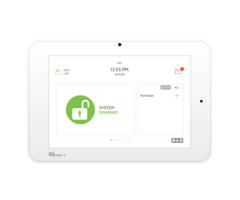 This makes it easier than ever for Telguard HomeControl users to operate their home automation devices. In order for this to be possible, users will need a HomeControl Flex subscription and a Telguard FlexHub. To enable voice control, start by enabling the HomeControl Flex Skill through the Amazon Alexa App.The Alexa App will then walk you through the rest of the setup process. From there, you will be able to control your home automation devices using voice commands sent through your Amazon Alexa device. At this time, it is only possible to control home automation devices through the HomeControl Flex Skill. Telguard says that it will soon be possible for a user to arm their system in this manner as well. Make sure to keep an eye on our blog for further updates. Alarm Grid is now offering the T6 Z-Wave Thermostat from Honeywell. This intuitive device is excellent for controlling the HVAC system inside any home or business. It provides support for complete heating and cooling control, and it is very easy to set up compared to other thermostats. The Honeywell T6 uses Z-Wave Plus technology for communicating with an alarm system. It was previously known as the Lyric T6 Pro Z-Wave Thermostat, but Honeywell changed the name to simply T6 in order to avoid confusion with the Lyric lineup. 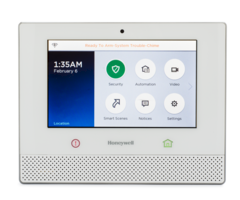 The device will work with any alarm system that supports Z-Wave devices, including the Honeywell Lyric Controller. Although it is manufactured by Honeywell, the T6 will work with other brands of systems that support Z-Wave as well. Depending on the system that is used, the T6 can controlled from Total Connect 2.0 or Alarm.com. One thing that makes the T6 great is its ability to be used without a common power from a C-wire. Instead, the thermostat can operate effectively on battery power alone. But if a C-wire is used (which is usually 24VAC from the HVAC equipment), then the thermostat will allow other Z-Wave devices to operate through it as their wireless signals travel back to the Z-Wave controller. But this feature cannot be performed if the T6 is running on strictly battery power. We have already tested the T6 Thermostat with the Lyric Controller to great success. Our team is particularly impressed with the device's ease of setup and its overall clean user interface. 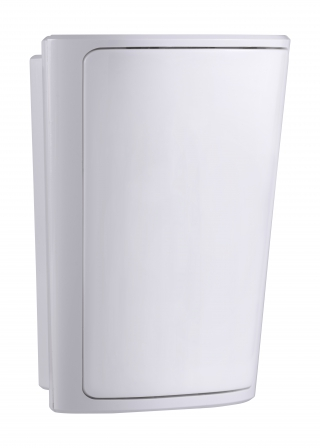 Z-Wave plus capabilities allow it to function extremely reliably on a Z-Wave network, making it a very dependable device. It also provides excellent flexibility with its ability to be used with a C-wire. All of this makes the T6 our new favorite Z-Wave thermostat. You can purchase yours on the Alarm Grid site right now! DSC Joins the Alarm Grid Family! Hi DIYers! Alarm Grid is proud to officially offer DSC Panels and security sensors. 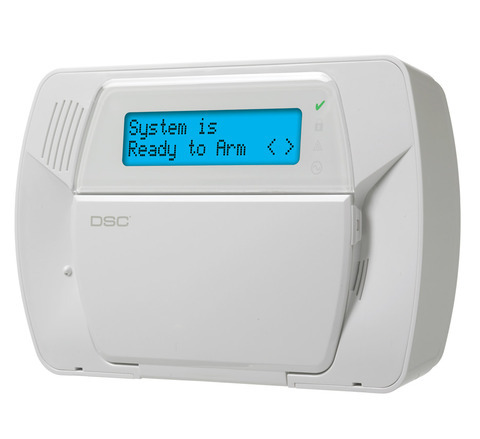 As of today, DSC equipment is now available for purchase from Alarm Grid. This includes the wireless all-in-one DSC Impassa System, legacy DSC 433 MHz Sensors, DSC PowerG Sensors and DSC hardwired sensors. DSC (Digital Security Controls) is a Canadian company that has been providing great innovations in security technology since 1979. The company is known for its reliable equipment that is used for monitoring homes and businesses worldwide. Their panels and sensors provide exceptional performance, and they are constantly providing great innovations for the security industry as a whole. Our launch for DSC products is based around the DSC Impassa. This is a wireless all-in-one system with an integrated touch-button controller. The main benefit to the Impassa is that it is the only wireless DSC System that provides support for 433 MHz sensors and offers local installer programming. And with an Alarm.com cellular communicator, the system can readily receive cellular monitoring and access the Alarm.com service. All of the DSC Impassa Systems being sold by Alarm Grid will include an integrated cellular communicator designed for use with either the AT&T or the Verizon network. We are also extremely excited to offer the new DSC PowerG Sensors as well. These are some of the most powerful and versatile security sensors we have ever seen. The PowerG Sensors operate at a wireless frequency of 915 MHz, which prevents them from interfering with system peripherals that operate on the lower 300-400 MHz bands. What makes these sensors particularly amazing is their ability to operate nearly half a mile away from an alarm system in an indoor setting. This makes them perfect for many applications, such as in barns or detached garages. All PowerG Sensors are also protected by 128-bit AES encryption to prevent them from being taken over. Please note that the DSC Impassa will NOT work with the DSC PowerG Sensors. At this time, we do not offer any panels that can support these devices. However, Qolsys has stated that they should soon be releasing a PowerG daughtercard for their IQ Panel 2 System. This is a perfect solution for users who want to integrate PowerG Sensors into their setup. Additionally, we plan to add DSC Security Systems that do support the PowerG devices in the near future. We'll make sure to provide you with any updates through our daily blog. If you need sensors for a DSC Impassa, you should go with the legacy DSC 433 MHz Sensors. These are reliable sensors that have proven to be very effective in countless installations. We are happy to announce that these sensors are now available on our site. Additionally, we also have a brand-new selection of DSC hardwired sensors that are available as well. These hardwired sensors can be used in essentially the same way as hardwired Honeywell sensors, and we have many options to choose from. If you have any questions about DSC Systems or Sensors, please contact us for additional support. You may email us at support@alarmgrid.com or call us at 888-818-7728 from 9am to 8pm M-F.
Hi DIYers! Yes, we just had a video recap a few days ago. But we wanted to get out this week's edition early, since we have an exciting announcement coming Monday - it's a secret! We still have four great videos starring Dylan and Jorge this time. These videos focused on Honeywell products. Dylan goes over the programming process for a Honeywell 5816 Door and Window Contact. This is a wireless sensor that works with Honeywell and 2GIG Systems. To learn the 5816, access zone programming, and put the system into its sensor enrollment mode. Then separate the sensor from its magnet to activate it. The system should recognize the sensor. Repeat this process two more times to learn it in. Then configure the settings for that wireless zone, and save your changes. Dylan talks about how to change the Master Code for a Honeywell LYNX Touch System. The Master Code is the code that is primarily used for system arming and disarming. Unlike the Installer Code, a user will certainly want to change their Master Code. Leaving this code at its default could present a major security risk if an intruder knows the default code. The Master Code on a LYNX Touch can be changed from the user-level programming menu. Jorge explains that the Tuxedo Touch cannot be used as an external keypad for a Lyric Controller. 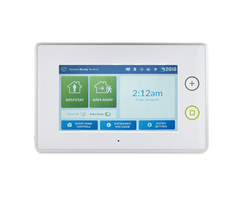 The Tuxedo Touch is designed to be used with a hardwired Honeywell VISTA Panel. The device will provide a VISTA with a touchscreen controller, and it also serves as a Z-Wave controller for integrating home automation devices with the system. The Tuxedo Touch will not work with the Lyric Controller. If a user wants an external keypad for the Lyric Controller, they should use the Honeywell LKP500. Jorge discusses how the Honeywell Lyric Controller can be self-monitored. This means that the system will not connect with a central monitoring station. Instead, it will be up to the end user to report any alarm events to the authorities. This is made possible using a service called Total Connect 2.0. Any alarm event that occurs will be sent from the Lyric System to Total Connect 2.0. The user can then receive a text and/or email alert directly from Total Connect 2.0 to immediately let them know about the alarm. Check out our Monitoring Page to learn more. Hi DIYers! In today's product highlight, we are featuring the Honeywell SiXGB Glass Break Detector. This wireless glass break sensor is designed exclusively for use with Honeywell Lyric Systems, including the Honeywell Lyric Controller. The device is great for monitoring any glass windows or protective glass casings. The SiXGB is the only glass break detector from the Honeywell SiX Series lineup. These are some of the most advanced pieces of security equipment available today. 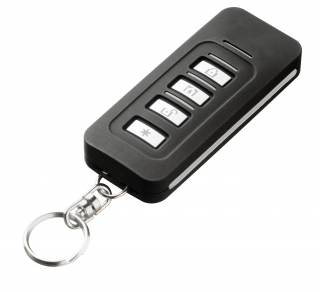 Like the other SiX Sensors, the SiXGB is fully protected with 128-bit AES encryption. This makes it nearly impossible for hackers or potential intruders to wirelessly take over or disable the device. 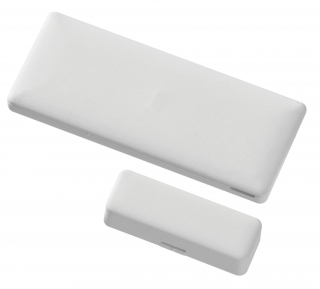 As a wireless sensor, the SiXGB communicates with the Lyric using a 2.4 GHz WIFI signal. The device boasts a maximum communication range of up to 300 feet. It is bi-directional, and it can receive automatic updates from the system itself. The sensor features a sleek and modern design that will fit in with almost any decor. Integrated LED lights assist with both device testing and enrollment. The SiXGB is available for purchase on the Alarm Grid site. Get a SiXGB for your Lyric System today! Door alarm sensors, or contacts, are some of the most important devices used with security systems. These devices alert a user whenever their door is opened. They can be used on virtually any type of door. These might include a front door, a back door, screen doors, a patio door, a shed, cabinets and any door inside the building. We typically find that door alarm sensors are some of the easiest to use devices with an alarm system. But still, it can be helpful to read through a comprehensive guide explaining the full ins and outs of these devices. So it here is - everything you've ever to know about door alarm sensors. Most traditional door sensors feature a relatively simple design and premise. These devices usually consist of a sensor and a magnet. The sensor is placed on or inside the door frame, and the magnet is placed on or inside the door itself, within a half inch of the sensor. Opening the door will cause the magnet to pull away and separate from the sensor. When this happens, a reed switch inside the sensor will activate. This will cause the sensor to send a signal to the security system, letting it know that the door was opened. The system will then perform the appropriate response based on how the sensor's Response Type was programmed. At the surface, it's all very simple. Some examples of these traditional sensors include the Honeywell 5800MINI, the Honeywell SiXMINICT and the VERSA-2GIG Sensor. Traditional door sensors can be either surface-mounted or recessed. There's also a second variation of door sensors, known as mechanical door sensors. This type of sensor features a physical switch that is pressed down when the door is closed. When the door is opened, the switch will pop up, causing the sensor to activate. From there, the system will perform the Response Type assigned to the zone for that sensor. This type of door alarm sensor is far less common than the other type of sensor. However, the end result is still the same - the system will still perform the programmed Response Type when the sensor is activated. An example of this type of sensor is the Honeywell 5800RPS. While you are less likely to come across this type of door sensor, it's still worth mentioning just in case. Mechanical door sensors are only available in the recessed variety. Now that you know the very basics of door sensors, you can start thinking about the different types. While almost every door sensors operates using one of the two mechanisms mentioned above, there are two other distinctions that are commonly made between door sensors. These are whether the door sensor is wireless or wired and whether the door sensor is surface-mounted or recessed. These considerations will play a big role in determining which door sensor you choose to purchase for your alarm system. A wireless door sensor will communicate with an alarm system wirelessly. This will prevent the need for running a wire from the system to the door sensor. This can make wireless door sensors significantly easier to install. Another great aspect of wireless door sensors is that they can usually be auto-enrolled with the security system. That said, a wireless sensor will need to have its battery replaced every three to five years. On the other hand, a wired door sensor will need to be physically connected with the alarm system. This can make the installation considerably more difficult in certain cases. However, a wired sensor will never require any battery replacements. If you are using a wireless door sensor with a wired alarm system, such as a Honeywell VISTA Panel, then you will need to use a wireless receiver. This will allow the wireless signal to be received by the system. When choosing a wireless door sensor, make sure that the wireless frequencies it uses are compatible with your alarm system. For example, Honeywell Panels look for wireless signals that operate at a frequency of 345 MHz, while Qolsys Panels use signals that operate at a frequency of 319.5 MHz. If you try to use a wireless door sensor that does not communicate at the correct wireless frequency, then it will not function with the alarm system. The other major distinction between door sensors is surface-mount sensors versus recessed sensors. Simply put, surface-mount sensors are installed on the outside of the door and its frame, while recessed sensors are installed in the inside. Surface-mount sensors require no drilling. In the easiest scenario, it is possible to mount them using a double-sided adhesive (foam tape). They can also be mounted using screws. With their easier installation, this is generally the preferred type of door sensor. Most users do not mind the fact that a small sensor will be visible on the outside of the door. However, for users who do want a more discrete installation, there are recessed door sensors. These sensors and their magnets need to be inserted into holes that are drilled into both the door and the frame. The exact size of the holes will depend on the specific model of the recessed door sensor that is being installed. Once the sensor and magnet have been installed, they will not be visible from the outside. That said, most users opt for surface-mount door sensors due to the easier installation. Entry / Exit: If the door is opened while the system is armed stay or armed away, then the system will need to be disarmed within its entry delay period. If the system is not disarmed within this time period, then an alarm event will occur. Most alarms will feature two different Entry / Exit settings. This allows two different entry delay periods to be used on the same system for different zones. Perimeter: If the door is opened while the system is armed stay or armed away, then an alarm event will occur immediately. Interior Follower: If the system is set to armed away, an alarm event will immediately occur if the door is opened, assuming that an entry / exit zone is not faulted first. If an entry / exit zone is faulted first, then the system must be disarmed within its entry delay period, otherwise an alarm event will occur. Interior With Delay: If the system is set to armed away and the door is opened, then the system must be disarmed within its entry delay period. If the system is not disarmed within this time period, then an alarm event will occur. Day / Night: If the system is disarmed and the door is opened, a trouble event will occur on the system. If the system is armed away or armed stay and the door is opened, an alarm event will immediately occur on the system. 24 Hour Audible: Opening the door will immediately cause a full system siren and an alarm to be set off, regardless of what state the system is currently in. This Response Type should not be used unless the door should never be opened for any reason. 24 Hour Auxiliary: Same as 24 Hour Audible, but only the panel itself will produce a siren. Any external sirens or noisemakers will not activate. This zone type is ideal for emergency medical cabinets that would only be opened in a serious medical emergency. 24 Hour Silent: Same as 24 Hour Audible, but no siren or sound will be produced. Fire No Verification: Opening the door will immediately cause a fire alarm to be set off, regardless of what state the system is currently in. This is the ideal Response Type for fire doors. Certain Response Types are only available for certain Device Types. Depending upon the panel you are using, not all of these Response Types will be made available for the Device Type of "Door". A way to work around this is to set the Device Type to "Other". This will allow you to set any possible Response Type for the door sensor. Programming a door sensor has to do with more than just the Response Type and the Device Type. Below are some of the other programming settings available for a door sensor. Please note that these settings are specific for a Honeywell Lyric Controller, and different settings may be available on another type of panel. Serial Number: This is how the system will specifically identify the exact door sensor that is being used. Loop Number: This tells the door sensor what function it should perform. Each door sensor usually has a specific loop number that should be set for the device to function as a door sensor. Some door sensors have multiple possible functions that can be used with the device. One example is the Honeywell 5816, which can be used as both a door sensor and as a wireless transmitter depending upon the loop number that is set. Zone Descriptors: These serve as the name of the door sensor. The panel will announce the zone descriptors whenever the zone for that sensor is affected. Alarm Report: This tells the system whether or not it should send an outbound signal to the central monitoring station. If you turn this off, then all the sounds and sirens will still be made, but a distress signal will never be sent to the central station. An example for turning this off might be if you are monitoring a liquor cabinet to make sure your teenage doesn't get into it. You might want a very loud siren to go off so that you know if this happens. However, you obviously wouldn't want the police to show up at your house in this situation! Chime: This will have the panel produce a simple chime whenever the door is opened. Many panels will allow you to toggle between different chime options for the panel. Remember, you will still need to have the local chime for the system enabled from the main settings menu. Supervision: This will have the system monitor the door sensor for low battery or loss of signal. Keep this enabled to make sure that the door sensor is always in proper working order. This setting is only used with wireless door sensors. For any programming questions related to a specific panel, please consult the programming guide for that panel. This information is readily available on the Alarm Grid website in the form of FAQs. 1. How do I program my door sensor? If it is a wireless door sensor, it can most likely be auto-enrolled.This is accomplished by accessing zone programming on the system and then faulting and restoring the door sensor three times to learn it in. You can fault and restore the door sensor by separating the sensor and the magnet and then clicking them back together. From there, make any necessary programming configurations on the panel. See the above information on Response Types and other programming settings. If it is a wired door sensor with a hardwired VISTA Panel, then we recommend consulting this FAQ. You may also need to consult the VISTA 15P and 20P Programming Guide. 2. How long do door sensor batteries last? A wireless door sensor will typically require a battery replacement every three to five years. Wired door sensors do not use batteries, and they will never require a battery replacement. 3. How close should the door sensor be to its magnet? We usually recommend placing the door sensor magnet within a half inch of the sensor. Some sensors may allow for a greater separation distance than others before a faulted zone will occur. The closer the magnet is to the sensor, the less likely an unwanted fault or a false alarm is to occur. 4. Are there any encrypted wireless door sensors? Yes, there are encrypted wireless door sensors. The Honeywell SiXCT, the Honeywell SiXMINICT, the Qolsys IQ DW MINI-S and the Qolsys IQ Recessed Door-S are all encrypted wireless door sensors. 5. What is the best door sensor? What Are the Best Wireless Door/Window Alarm Contacts? What is the Best Wired Door/Window Alarm Contact?